TSWREIS Entrance test Acknowledgement. 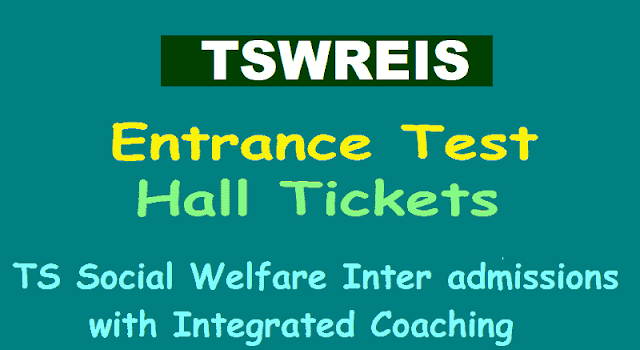 TSWREIS Entrance test Hall tickets. Tswreis Entrance test hall tickets, Acknowledgement for 'Inter with Integrated Coaching' 2019-2020. #TSWREIS Entrance test for Admission into 1st Year Intermediate with Integrated Coaching for IIT-JEE / EAMCET / NEET / CA-CPT : 2019-2020. TSwreis TS Social Welfare Notification for Admission into 1st Year Intermediate With integrated coaching for IIT JEE/EAMCET/NEET/CA-CPT/CLAT- 2019-19. Free Inter with Entrance exams Free Coaching admissions 2019. Telangana Social Welfare Residential Educational Institutions Society(TSWREIS) has issued an entrance test 2017 notification for Admission into 1st Year Inter With Integrated Coaching For IIT-JEE / EAMCET/CA/CPT in the institutions of Society. The TSWREI Society is inviting online applications from eligible and qualified Boys and Girls for appearing entrance test for admissions into 1st year intermediate MPC (with IIT-JEE/EAMCET coaching) and BPC (with NEET Coaching) and MEC/CEC (with CA/CPT Coaching) with English as the medium of instruction for the academic year 2019-2020. "Applicant Details Registered Successfully. Please Note Your Reference Number: 987654 for further Communication. Download Acknowledgement. Hall tickets can be downloaded from the official web portal. Note: 1. Enter the details, which you have given while applying. 2. Entry of any two fields is mandatory to get Hallticket / Acknowledgement." 1. Read the questions carefully. 7. There will be negative marks @ 1/4 mark for each wrong answer marked by the candidate. 8. If the Photograph is not clear / Visible on the Hall ticket, the candidates should bring Photo Identify proof (Aadhar Card) and a Photo should also be pasted and got attested by Head Master concerned in the Certificate at the bottom of the Hall ticket. 9. No student will be allowed to the examination hall after 10 minutes from the commencement of examination. 10. Use blue (or) black ball point pen only to circle in the OMRs. 11. Usage of pencils is prohibited. 12. Out of the four given options only one should be bubbled. If more than one answer is bubbled it will not be valued. 13. Erasing, using markers, applying whitener is prohibited. 14. Do not make any stray marks on the OMR sheet. 15. OMR Sheet should not be mutilated (or) torned. 10.02.2019 through online. The same has to be certified by the Principal / Head Master, where the candidate is studying. Hall tickets can be downloaded from 10-02-2019.